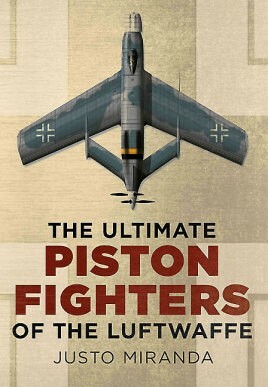 The Ultimate Piston Fighters of The Luftwaffe is not the book I thought it would be. I thought it was going to be a book about the possible 1946 air war, and all of the (some outlandish) propeller planes that Germany might have flown. Instead, it is an encyclopedia of all the different propeller fighters that were on the drawing board for pretty much the entire war. The introduction discusses the effects of 'compressibility buffering' and how advanced the Germans were in understanding it. Then it goes on to list all of their major aeronautic testing sites, especially the wind tunnels that were state of the art, for the time. It also examines the effect that the blockade had on German industry, and their attempts to come up with ersatz solutions for the missing pieces, such as high octane fuel, oil, and rubber. One of the things the Germans could do nothing about was the lack of metals like chromium and molybdenum that were used in hardening steel. Without these, their jet engines would always be prone to breakdowns, meltdowns, and have a generally short life. The Jumo 004 jet engines sometimes had a span of only thirty hours between overhauls. The German airplane industry worked hard to develop the best piston engine fighters they possibly could. The book is not a compendium of crackpot last minute war winning schemes. It is a treasure trove of actual designs for the continued development of in use aircraft (BF 109, FW 190 etc. ), and some advanced aircraft and weapons that we were lucky to not have to face. The book has more than a few plans for for dual contra-rotating propeller planes. This then segues into the development of the ejector seat, these being needed to escape instant and horrible pilot death by the pusher props. The book continues with plans for large caliber weapons, and then goes on to show the many rocket projectile plans. There are also some plans based on the 'Schrage Musik' weapons. These were weapons that were pointed at an angle coming out of the top of the airplane, to allow night fighters to fire into the bombers' bellies from below. There are also some designs that were based on the photo sensitive rocket/shells that were actually used on some ME 163s. The shadow of the bomber going over the aircraft would set them off. At least one Allied bomber was lost to this weapon. Each plane and weapon is accompanied by scale drawings of them. The planes have listed their weapons, speed, and ceiling based upon wind tunnel experiments, etc. The descriptions are filled with the aircrafts' uses, and what specifications from the Luftwaffe they were meant to fill. The book is the ultimate for German prop plane junkies. Hopefully Mr. Miranda is working on more books about the other Axis and Allied countries' designs.